Time: 8:30am-5pm Limited to 24 children. Cost: 450-550 includes Transportation to and from Ithaca T-shirt, Daily lunch & snacks plus Family Dinner and Camp-out on Thursday. Come celebrate the 16th year of Village Camp – A Community Camp in which children of different ages come together to learn to live in harmony with each other and nature. 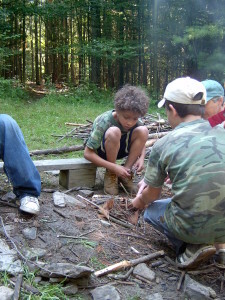 Children participate with the staff in a daily routine of homesteading chores such as animal and garden care, snack preparation and campfire cooking. Children are taught in a way that promotes unity, respect and sustainability. Village Camp includes “Community Projects” in which everybody works together to create and complete a project which will enhance the community. 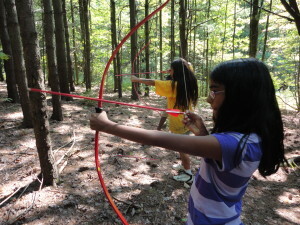 Activities may include primitive living skills, nature crafts, mountain biking, archery, scout games, fishing and outdoor adventures such as a Graveyard Hike, Treasure Hunts, Scout and Scavenger Missions, Mountain Biking Excursions, and Berry Hunts. At Village Camp parents and family members of campers are welcome to visit us and join in whenever they can. On Thursday evenings, we have a family celebration night, dinner and optional overnight. Village Camp has provided unique and rewarding experiences of a lifetime for many children. We hope you and your family will join us this summer. Camping is available for families at a discounted rate during the camp session. Click here for registration forms. Medical History Forms must be completed and returned 2 weeks prior to the beginning of the camp session. 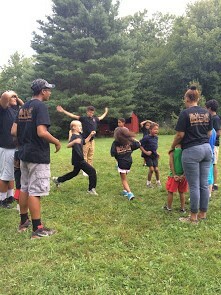 Since 2002, Earth Connection in partnership with Greater Ithaca Activities Center(GIAC) provides youth from limited income families from the GIAC community and beyond, full scholarships to attend Village Camp. To help please consider making a donation to the Village Camp Fund. 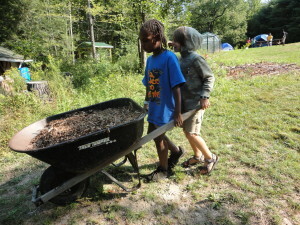 Donations to Camp Earth Connection can be made through the mail or paypal. Although we also use 100% of these funds for scholarships, they are not tax-deductible. Please contact us at campearthconnection@gmail.com for information. Thank you.